Barnacle Jones was involved in an accident in which his boat was destroyed and he sank to the sea floor of Void Harbor. There he found a chest as his life ebbed away, its contents are a mystery though they allowed his spirit to remain in the suit after his body failed. So he lived in the darkness of the crushing waters, using the powerful diving suit as a shell and physical body and sapping the life force from monstrous sea creatures easing if never quenching his thirst. Now something calls, he senses a gathering of powerful spirits from above. Memories of his previous life float down to him and his hunger surges for the lives he knows thrive above the surface. Stretching the ectoplasmic tendrils toward the surface he slowly begins to rise. 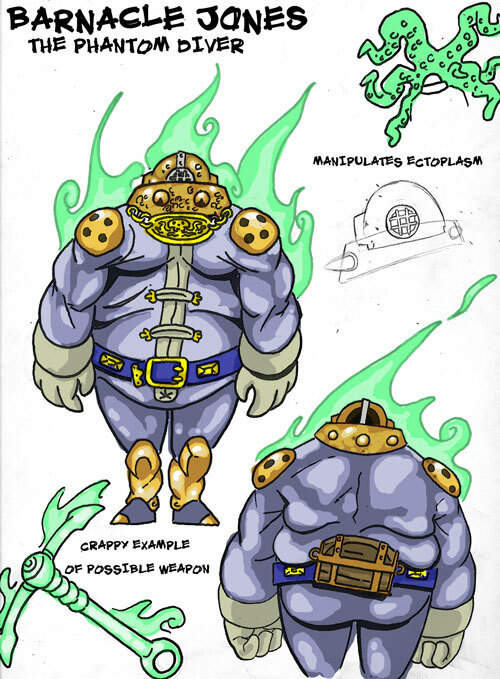 His powers include the ability to shape his ectoplasm into weapons, an anchor is his prefered hand to hand weapon and can create tentacles, giant crab claws, etc. His suit provides enormous strength and has no effect to pain. He carries the mysterious chest on the back of his large belt and visciously guards it. Jones stands right at eight feet and weighs several hundred pounds keeping him from being the most agile of fighters.